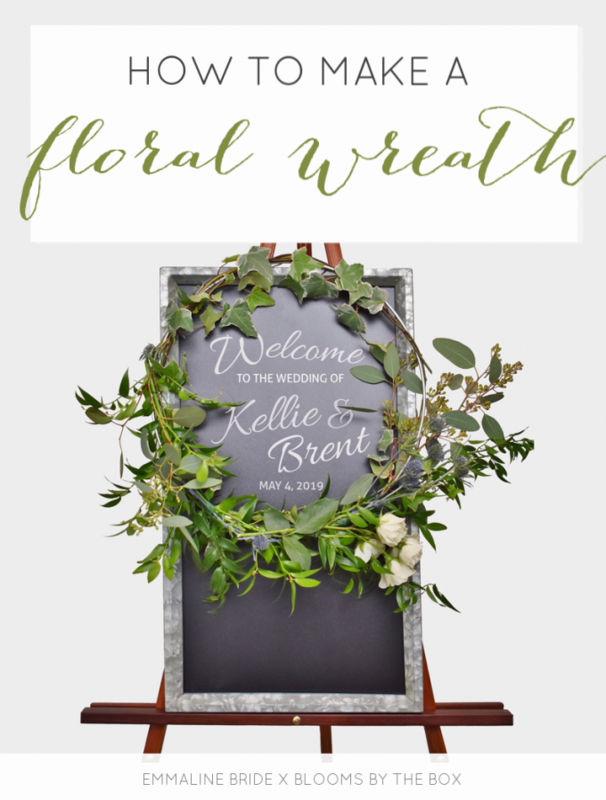 Today’s flower wreath is designed for the entryway of your wedding as a welcome sign; however, I know I’ll be copying this tutorial to make a flower wreath for my own front door! 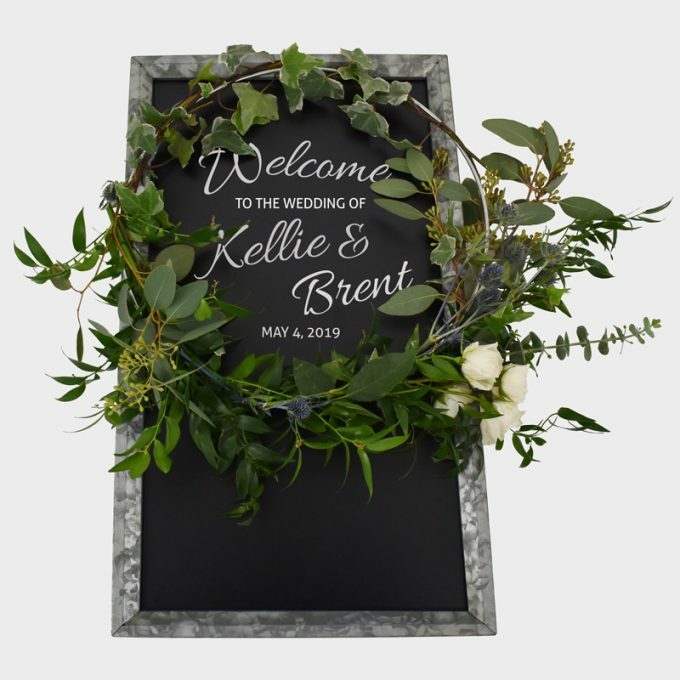 I can’t wait for spring to get here, so adding a pretty eucalyptus and flower wreath sounds like a lovely way to let in a little spring. This tutorial is designed by Tina of Blooms By The Box, a crafty do-it-yourself-er who you’ll see regularly at Emmaline Bride this year. She has designed exclusive tutorials for our readers and today we’re kicking off the very first one! *throws confetti* (Make sure you subscribe so you don’t miss upcoming DIYs!) 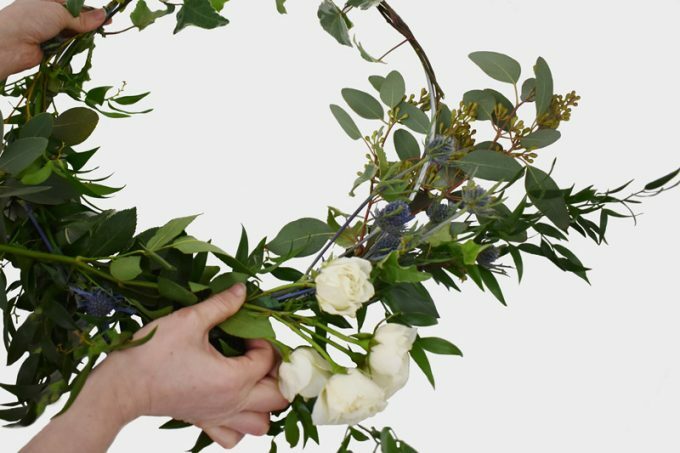 In this DIY, you’ll learn how to make a flower wreath with easy-to-find wreath supplies and helpful step-by-step instructions. 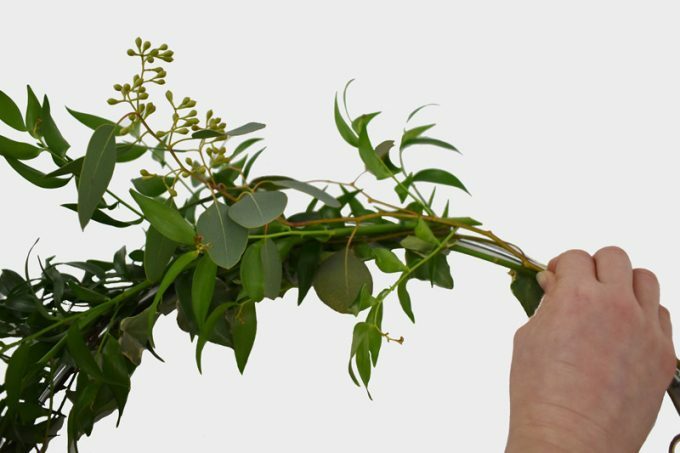 This wedding reception wreath is made of eucalyptus, ruscus, ivy, thistle, spray roses, and eucalyptus. 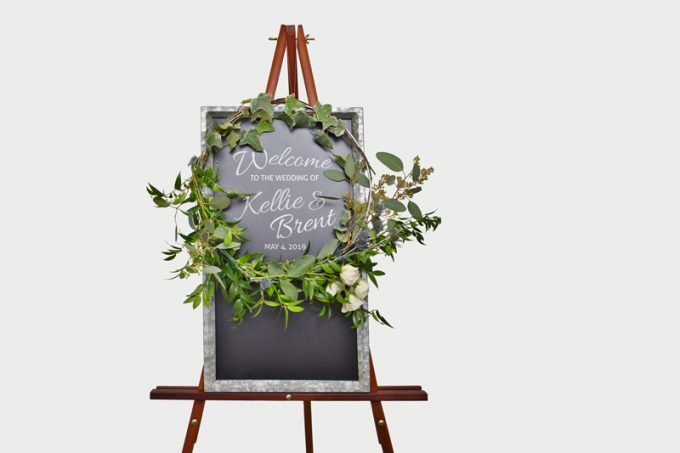 This flower wreath is designed on a chalkboard and easel to welcome guests to your reception. 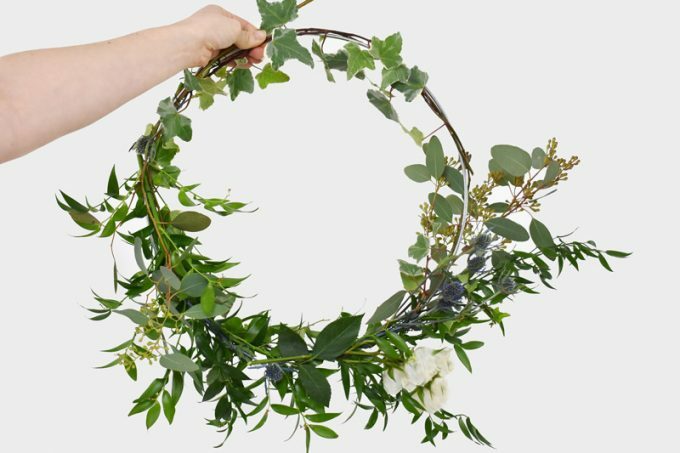 As an alternative, you can make this wreath for your ceremony entry doors or your front door for spring. It will smell amazing — oh, how I love eucalyptus and roses! 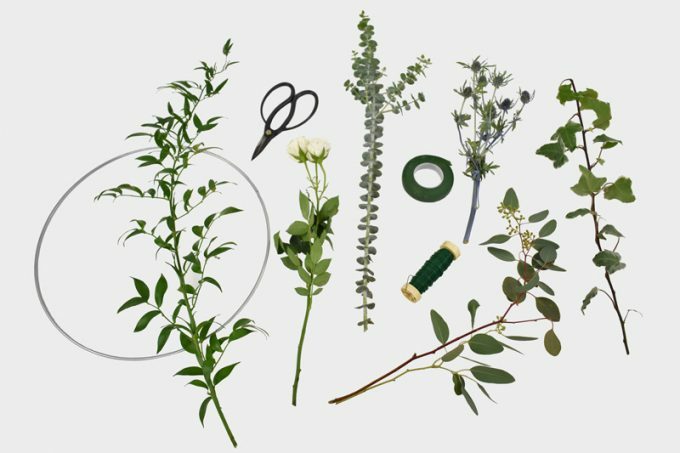 To make a flower wreath, you’ll want to first gather up the wreath supplies and materials needed. 1. 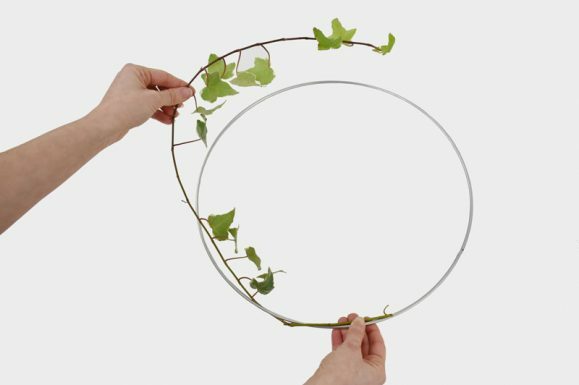 Line the metal hoop with a long stem or two of variegated ivy by wrapping the stem around the circle. 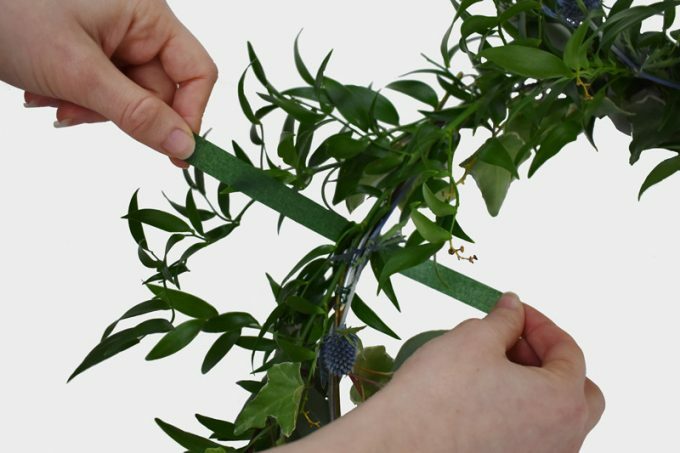 Use lightweight floral wire to secure the stem in place. 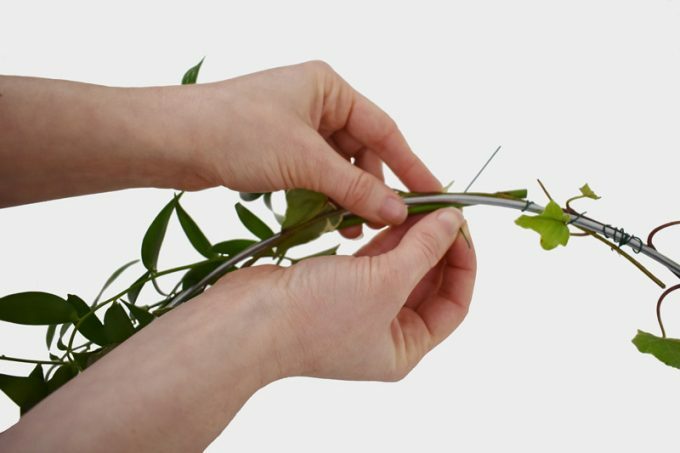 Wrap stems without seeing the wire. 2. Starting halfway on the hoop, mix in Italian Ruscus using your wire. 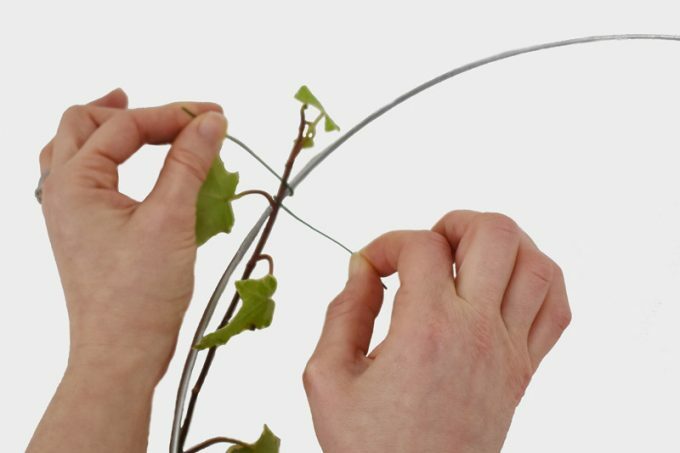 Twist wire and secure stems of Ruscus to the metal hoop. Overlap the stems. 3. Add in seeded eucalyptus to add texture. 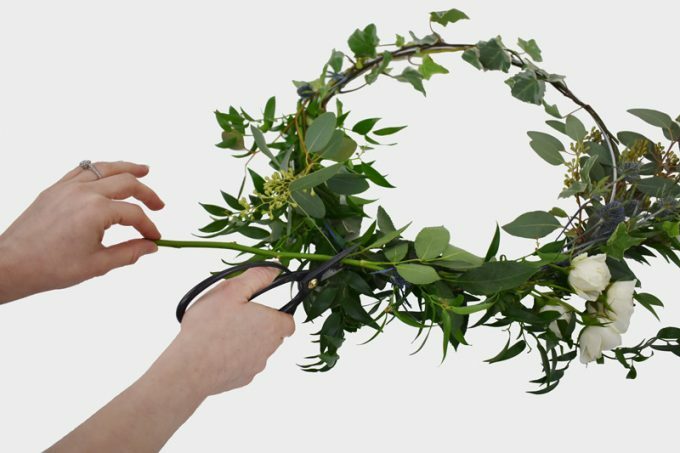 Fill the bottom of the wreath and let the greens flow freely. Add stems until the bottom of wreath base is covered. Keep metal hoop exposed for texture. 4. 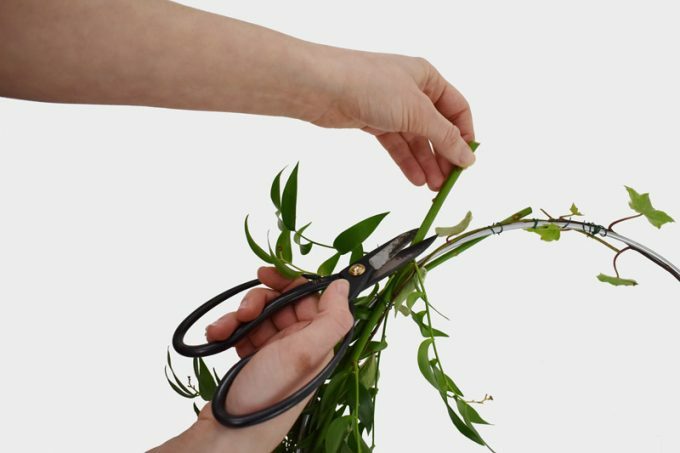 Trim the end of any stems that stick out straight. 5. Place a stem of white Spray Rose toward the right bottom of the wreath, free-flowing tucked in with the greens. 6. 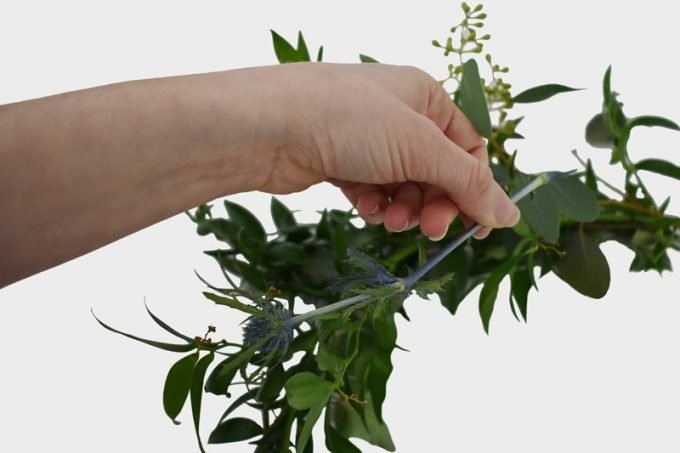 Use floral tape to help keep your flowers or thistle in place. 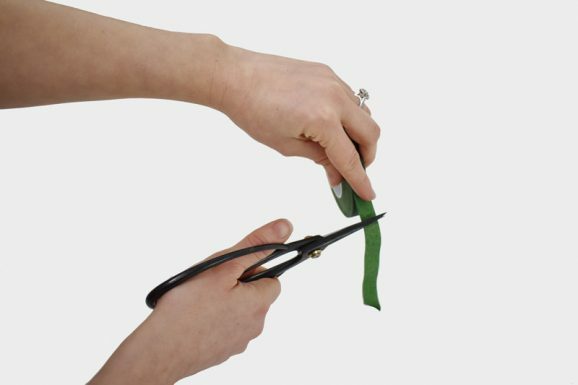 Trim any excess tape for a clean look. 7. Weave stems of Thistle Dynamite in-between greens and above the roses for texture and a hint of color. 9. 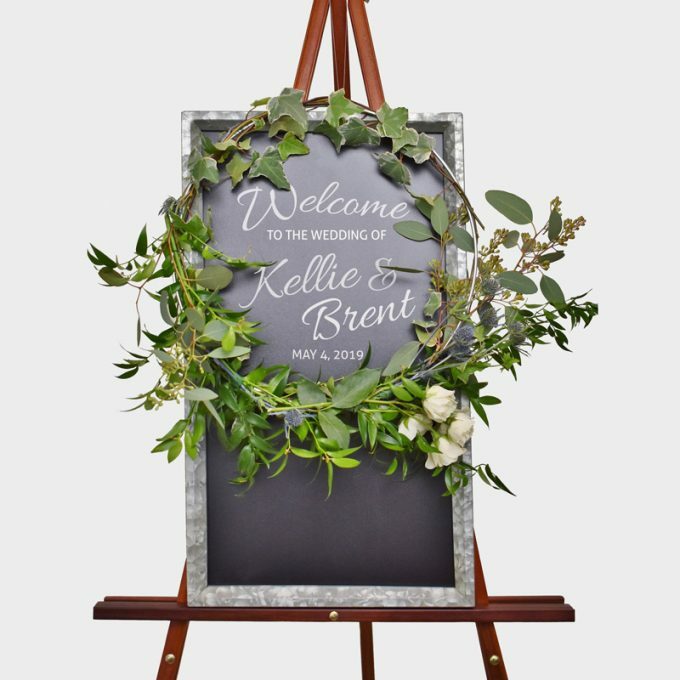 Wire wreath to sign. To see more tutorials and get inspired, visit the website here. So, tell me: are you going to make a flower wreath? What do you think of this welcome sign idea? It’s snowing outside right now, but I know spring is around the corner. I hope you’re keeping warm out there! Comment below with any questions on this easy wreath tutorial. We can assist with questions you may have. This is a sponsored post collaboration / tutorial with BloomsByTheBox.